Thermiculite® High Temperature gasket materials are rated for temperatures from cryogenic up to 1000ºC, have passed the API 607 fire test, and are free from oxidation. Due to our unique formulation, we are able to offer Thermiculite® as a sheet material, as a filler for Spiral Wound Gaskets, as a facing for Kammprofiles and also in many of our other product lines. Thermiculite® 835 spiral wound gasket uses high temperature filler material which has max temperature to 982ºC (1800ºF) and Class 150 to 2500. Kammprofile offers the compressibility of a sheet gasket for low sealing stress, along with the bolt tightness of a spiral wound gasket - plus the handling ease of a solid metal gasket and its resistance to buckling. The Kammprofile gasket fights against flange rotation, bolt stress relaxation, and creep - even under extreme pressure and temperature fluctuations. 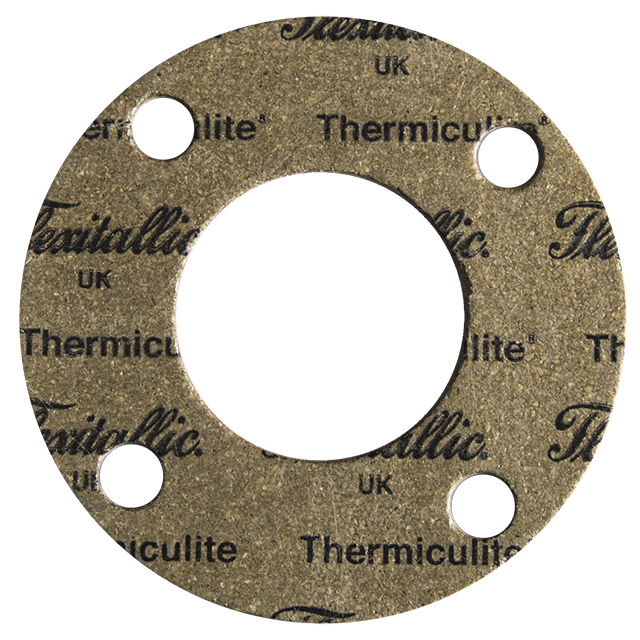 Flexitallic Thermiculite® 845 Kammprofile uses high temperature facing material which has max temperature to 1050ºC (1920ºF) and Class 150 to 2500. High temperature sheet reinforced with a 0.004˝, 316 stainless steel tanged core. Provides total freedom from oxidation. Chemical compatibility exceeds graphite. Fire safe with proven global track record. High temperature coreless sheet material. Replacement for compressed fibre sheet material and tanged graphite sheet. Manufactured with non oxidizing fiber with a higher required seating stress, ensuring good load bearing properties. It facilitates proper installation by maintaining flexibilty, non-contaminating, good chemical resistance and fire safe. Thermiculite® 894 comprises of a series of braided ribbons of Thermiculite foil that have been previously over-knitted with a fine Inconel wire. The wire imparts excellent handling characteristics, minimises extrusion under compressive load and improves blow-out resistance. Typical sealing applications involve the high temperature, direct or catalytic gaseous oxidation processes used in the manufacture of mineral acids and fertilizers. Supplied in spool stock form the material is a flexible, easy to use and cost effective replacement for traditional gaskets and other high temperature rope type sealing products.